2 New Singles Released Today! On March 1st, Toronto-based (and Edmonton grown) singer-songwriter Danielle Knibbe will be releasing her sophomore album The Ribcage & The Heart. Every song on the new album has a counterpart that explores the same theme – a “ribcage” and a “heart” song. Two of the songs from the album, ‘Long Distance’ and ‘Footnote’, are officially released today as a 2 song EP (think side A and side B) entitled INSECURITY, after premiering on January 10th on Spill Magazine. 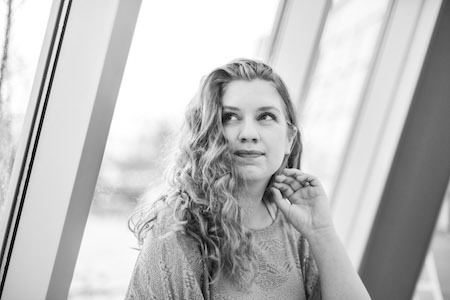 Danielle Knibbe named the 2-song EP, INSECURITY, because 'Long Distance' and 'Footnote' both explore a specific type of insecurity, which is insecurity within a relationship. "'Long Distance' is a reflection on a time when my boyfriend (now-husband) was going to school in Toronto and I was based in Edmonton," says Danielle. "He was always so stoic when he had to leave to go back to Toronto, and I would be a complete mess. This song is everything I wish I’d had the nerve to say in the moment, and it only took me six years to work up the courage. And 'Footnote' is about feeling replaceable in a relationship. Love can be a temporary thing, and it’s so incredibly terrifying to give yourself to someone with the knowledge that one day they might not even remember your last name." The release of the 2 INSECURITY tracks follows the release of 2 INFATUATION themed songs, ‘Agony' and 'Simple Love’ back in November 2018. All 4 songs will be included on Danielle Knibbe’s The Ribcage & The Heart album which is full of examples of her lyrical skill, with three of the songs having been selected for print in American Songwriter’s monthly lyric contest. This new album, mixed by Howard Bilerman (Arcade Fire, Basia Bulat) and featuring Fats Kaplin (John Prine, Jack White), showcases the depth, insight, passion, and potential of this up-and-coming songwriter.